I first started with a 5.5x5.5 card (just because I like working with this size), added a 5.25x5.25 piece of pink cardstock that I punched using SU ticket punch on the corners. Before I adhered it, I added a strip of pink satin ribbon and tucked it on the back. Then a 5x5 striped DP was added, again with the corners punched using the SU ticket punch. Next I dry embossed a piece of white card stock using the Argyle Cuttlebug Embossing Folder. I don't know if you can see it or not, but I lightly chalked the raised pieces to tie in the lime green colors. I punched out the bottom using Martha Stewart's lace punch and the corners were punched using the Fiscars Fancy Corner Punch. I stamped the rose with Versafine Black and used the Marvey markers to water color it. Before doing that though, I added the word Love under the rose and touched just a corner of the rose to tie it all together. I needed to add some of the lime green, so I cut out and embossed lime green cardstock using my circle scalloped dies and then added a circle of plain black circle for some pizazz. The rose is popped up with Thermo Web Dimensionals. I added just a simple lime green bow for more texture and to combine the colors. The smallest black pearls were added on the corners and at each scallop for extra interest. Beautiful card Joan! Love what your use of the cuttlebug here and the main image is gorgeous!! P.S. Received my clear boxes today and already have nearly all of them filled ... thanks! Joan, this is gorgeous! 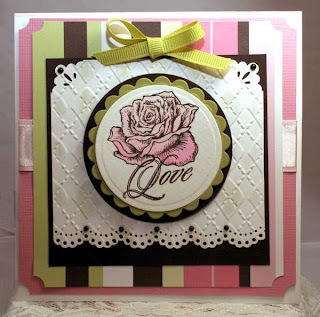 A beautiful rose, scallops, embossing, pretty colors--it's got everything I love most! Wonderful! DUH!! Found your card...didn't realize it was in a 2nd post. Mia Culpa and it's gorgeous. Oh my gosh, this is fabulous Joan, I love this stamp set! Love all the added elements to your design, just fabulous dar'ling! Every element is perfect, Joan! Beautiful card! Have a great day! Beautiful! I love how you colored the rose! Wonderful! Joan, this card is totally FAB!!! I LOVE your rose -- it is colored just beautifully!!! That vase with flowers on that set is so beautiful!!! Can't wait to see you use that!! Oh my gosh, this is gorgeous Joan, I love your roses! Such a Simply Stunning Card...I just Love it! It is so wonderfully put together. Love all the layers and embossing. The touches of color here and there. Truly a Gorgeous Card!